My choice for best ever American-born player in the NHL is Brian Leetch. He was born in Corpus Christi, Texas and moved to Connecticut as an infant, eventually enrolling in Boston College. 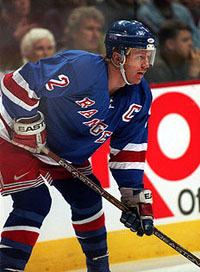 During his 18-year career, Brian Leetch was a two-time Norris Trophy winner as the NHL's best defenseman and was the first American-born winner of the Conn Smythe Trophy as Playoff MVP for his brilliant play during the New York Rangers' run to the 1994 Stanley Cup Championship. He is one of only five NHL defensemen to score 100 points in a season with his 102-point campaign in 1991–92. slovakia. He joined the Pittsburg Penguins from Kladno as an 18-year-old. Jagr has won the Stanley Cup, the World Championships and an Olympic gold medal. Jagr has been the NHL's leading point scorer five times and won a Hart Trophy as the league's most valuable player. He has been named to seven NHL First All-Star Teams. Jagr is the all-time leader among European trained players in career goals, assists and points. James Reimer has been the starting goaltender for the Toronto Maple Leafs since the 2010-2011 season.